The northern part of the Caribbean island of Saint Martin is a French overseas department. It is a small area with an important tourist industry. Public transport is by shared taxis (mini- and midibuses) on fixed routes with bus stops but without schedules. One larger company, G.C.E.E. of Grand Casse, has larger buses and coaches: several Otokar, Fast, and a Neoplan Tourliner were seen. Other large vehicles include a Setra and an Irisbus Axer. A BOVA Futura was seen in 2004. 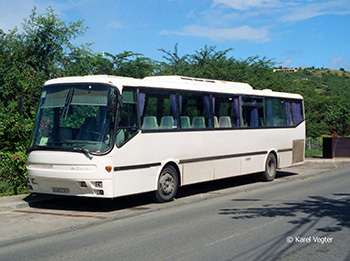 In general, the large buses are typical for the French bus market, contrary to the Dutch side of Saint Martin, where more exotic vehicles can be found. Ex US schoobuses can also be found regularly on the Dutch side of the island, but only one, out of service, was seen on the French side. Registration plates up to 2009 consisted of a combination of figures, letters and the departemental code 971. Since 2009 normal registration plates consist of four figures followed by AAA, then AAB and AAC being current. Public transport vehicles have four figures followed by the letters BUS and a government vehicle seen had four digits and the letters COM.